In the first iteration of my design I decided that using paper cut-outs to create my airship was impractical (see post below), and instead I decided to use papier mache. In my first iteration, I googled how to make papier mache and found out it requires flour and water, with white glue being optional and replacing water. because there was no flour within reach and class ends in 20 minutes , I decided to use white glue and water (although I suspect it was wood glue or some other non-white glue), on top of a balloon and a cardboard roll. The following day, when I inspected the fruits of my shoddy work, most of the mache on the balloon was soft and crunchy, and I could easily crush parts of it. The cardboard prototype was fine, apart from being halfway done, because the frame itself was hard and can support some pressure. 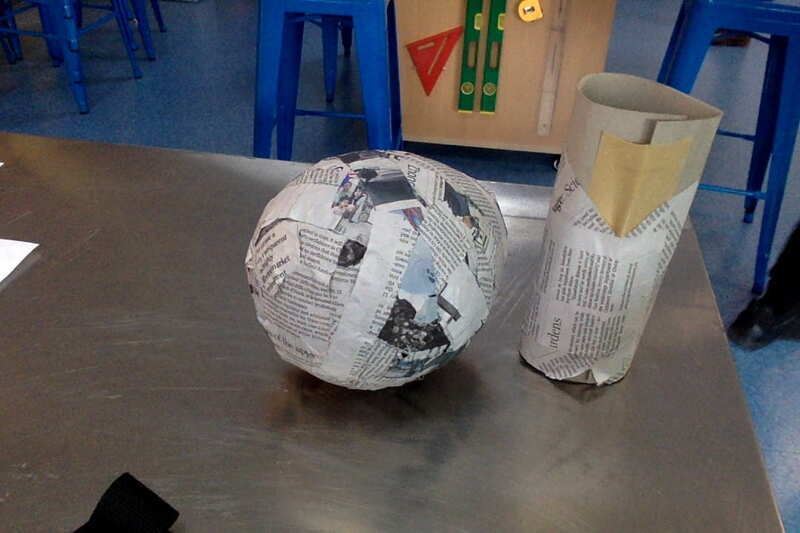 From this, I learned that papier mache requires multiple layers to be effective, and to make the mixture of papier mache needs to be much thicker (I ran out of glue). Learning from this mistake, I improved my mache by using paint in place of flour (which eliminates the need for painting my airship later), and using multiple layers, not because I wanted to, but because the head and tail was much bigger than the body, and I had to mache over those to cover it up. My Sketch (this idea was abandoned because it’s too complicated and I realized I can papier mache the balloon I without putting it in a wire frame (as originally planned), and it works just as well. My second prototype, made out of papier mache. 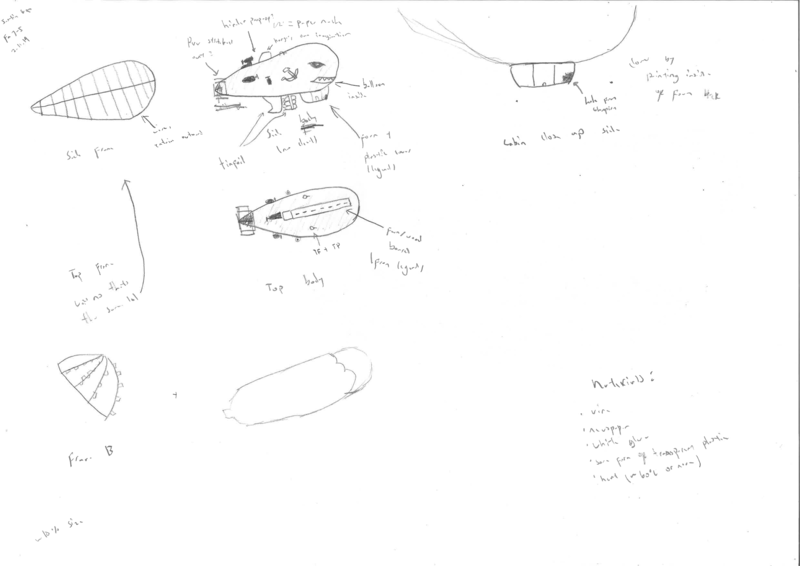 For my Ignite week project, I made a plan to build my Kirov airship. My original plan was to make a wire frame, put a balloon inside (I did a similar project in art with plaster, and the plaster sort of dipped inward & I had to put a lot more frames, so this time I wanted to try putting a balloon inside). This plan never materialised because we don’t have wire (pipe cleaners are too flimsy), and it was taking a while to make a frame out of pipe cleaners. My contingency plan was to take a water bottle, put a cap on it, and I’m done, but my bottle got crumpled and it didn’t have the shape I needed. I also tried using templates online, but that cutting them out took a while, before i finally settled on making multiple papier maches. 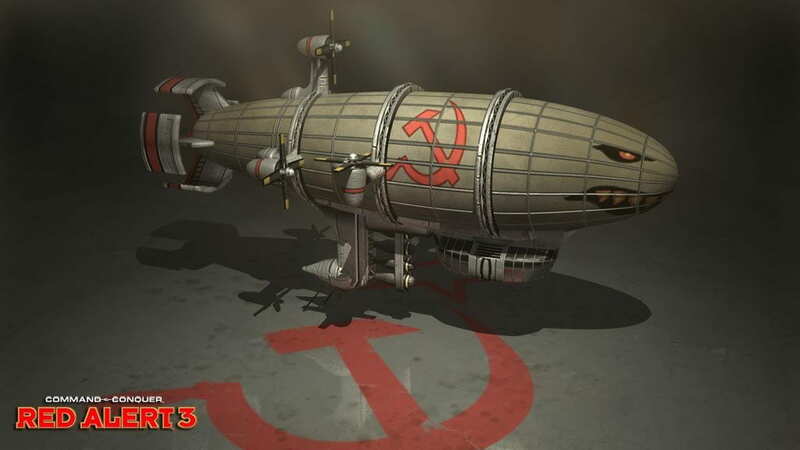 For ignite week, I would like to work on making a scale model of the kirov airship from Red Alert / command and conquer 1/2, with elements of the airships from prodigy. I was inspired by Legend / Red Alert, taking the general form of the airship from red alert and the cabins from Legend. My audience is someone who has played / heard of the command and conquer series, and people who have read the Legend series. I think the construction of my model is going to be made primarily out of wire and paper mache. I think a major challenge is going to be creating the part of the airship derived from the Legend series, the description of the airships in Prodigy & Champion (the 2nd and 3rd book of the legend series, respectively) is quite scarce. Through this project, I hope to improve my time management skills because I am working alone & I need to make my own plan for when things need to get done. Our second design was much better than our first. A major change that we made was that we increased the area of the parachute & replaced the relatively complex straw & string method of attaching the parachute in favour of a more straightforward method by simply taping the string to the parachute. This time, we just guessed the area of the parachute & made use of as much garbage bags as was available instead of calculating an area for specific rate of descent (still didn’t realize the dome / sheet parachute thing, so it probably wouldn’t have worked). During the drop, I noticed that the parachute was only half opened & kind of crumpled, instead of being really tight and catching all the air. This leads me to speculate that our parachute was far too big for the mass of our package, so instead of creating air resistance to slow the payload down, I think our parachute was following along the lines of a glider, in that it was kind of drifting. I think we could have used a smaller parachute more suited for the mass of our package to be more effective material (& cost) wise, while also slowing the package down further. Alternatively, I think we can make a hole in the center of our pre-existing design. I think what this would do is force the air down a smaller pipe, because when air hits the parachute without a hole, it would just double back and try to force its way out of the parachute from the side. When there is a hole in the middle of a domed parachute, I think the air would try and go through the middle, because it’s higher up & air is stationary (at least vertically & not horizontally / wind wise). Basically, the parachute would be moving down relative to the air, and the air would be (also relatively) moving up against the parachute. I think the air would all try to go through the middle hole because it’s closer to where they end up (the top of the parachute, also known as the centre). Then all of the air would try to get out of the parachute at the same time which would make more drag. Even if that fails, it would create more airflow inside the parachute (because now all the air caught by the parachute is trying to go in instead of back out) which would probably make it more effective, and also making the parachute tight (because moar airflow), which makes the parachute even more effective. One Day is important because it gives students a opportunity to be creative and do something that they usually can’t do. 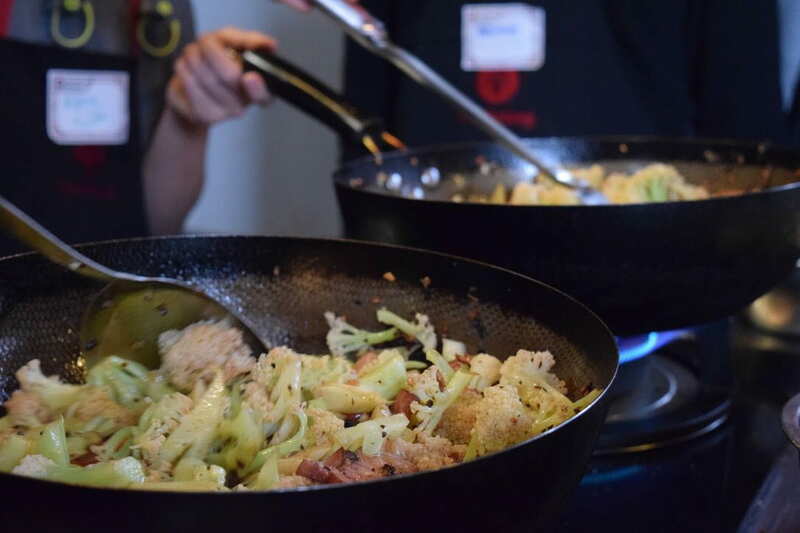 One day inspires students and encourages them to be creative & think outside the box. In January, the turbidity started to rise after a 30 NTU drop in November, while the pH increased. Turbidity on L3 decreased. In november, the turbidity of L2 decreased while L3 increased, and I can’t think of any logical explanation of why this is happening. 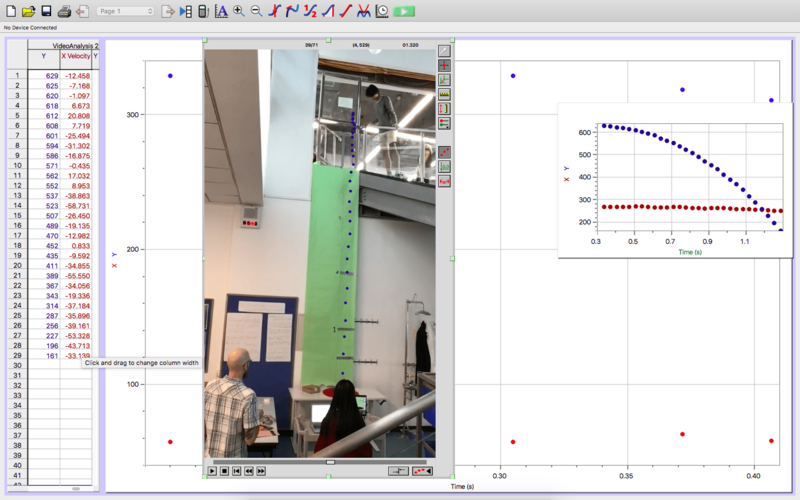 note: there was actually a drop before this where I wanted balloons to act as air bags and soften the fall, but I never got to test that, and a 2m drop showed that the balloons used were a bit too fragile, altho this might be good because it disperses energy (somehow). Our team constructed our design using cardboard (for the main package), a black garbage bag 534 cm in diameter (for a parachute), and string (to attach the parachute) When I dropped my design for the first time, I decided not to attach the parachute, because I don’t trust tape that much & I couldn’t think of any other way of attaching the parachute (for the moment), so I made a base triangle and just set the package on top. I don’t know why but I honestly thought that it would work, which it didn’t. The package fell off the design completely, off camera and off the force plate, so I have had no way of collecting any form of data. Our second drop went as well as the first, which means it went terribly. At this point, none of us had realized that the design flaw I explained below (except remarks like ‘that looks too smol’ and ‘mr frank said parachute must be 10x bigger than package’ or something). This time, our group decided to tape the parachute instead of using rubber band spam like I was attempting to secure the parachute. Ultimately, the method to secure the parachute really didn’t matter because the parachute was way too smol. When this is a curved shape, air has to travel more distance to get out of the way, which means more air inside the parachute at any given time, which means more drag. When I designed my parachute, I assumed that when I dropped it, the air resistance would (somehow) curve my flat parachute, which it sort of did. My diameter of 534 cm was calculated for a 3m/s descent, using a domed parachute, so my actual rate of descent was 6m/s (a 2 m/s decrease). I noticed this after both first drops with no more time (and garbage bags) to spare, so that’s that. During construction, I didn’t want to tape the string or hot glue it directly onto the parachute, because of a higher possibility of the strings coming loose due to the low contact area. I solved this problem quite easily by taping straws onto the parachute instead, which stayed on quite well. This is where the problems come in. Because I just had the string hanging loosely on the inside of the straw, when I exert a force on it, the parachute actually collapses inward. I discovered this in ground testing, so no harm was done & I just cut the straws down to half their old size. However, this introduced another problem because my already long paracord got even longer because of the shorter straw, which increased the probability of my strings tangling, the time it takes for the parachute to deploy, and general reliability. Finally, I only used 3 string lengths in my parachute, because I thought that more than 3 would take too long, and 3 is enough to keep something stable. I think we lost a lot of air resistance & the assorted lift because of a fluttering parachute. Some things in design 1 went quite well, for example, the straw idea I used worked extremely well, and there were no signs of fatigue after 2 drops. For our next design, we will improve by INCREASING THE PARACHUTE AREA and using more strings to secure the parachute & reduce flutter. In project collisions, I am developing a system to deliver portable chargers by drones. The drone will release the package from a height of up to 10 meters, and my job as an engineer is to design a package that will protec my package as it falls. Drop 0, a unprotected package with dimensions of 13cm x 8cm x 9cm was dropped from a height of 5 meters. 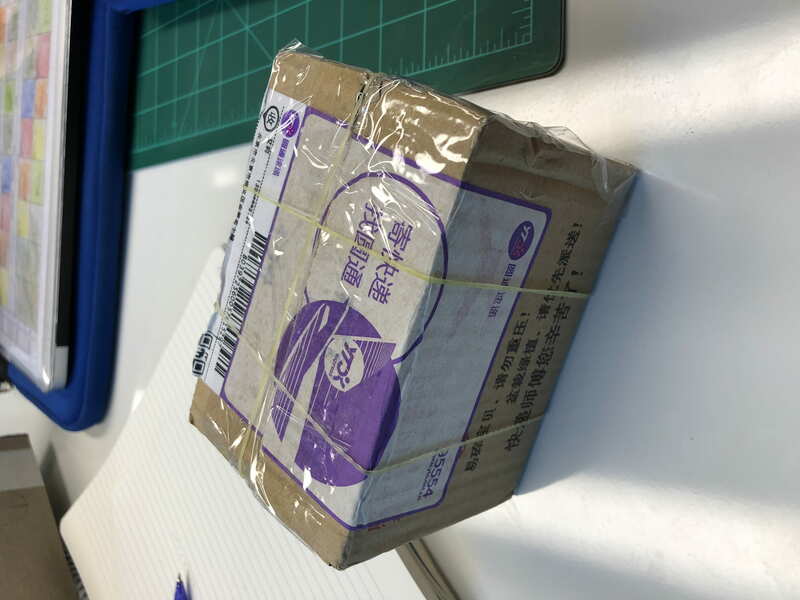 below is a photograph of the package. 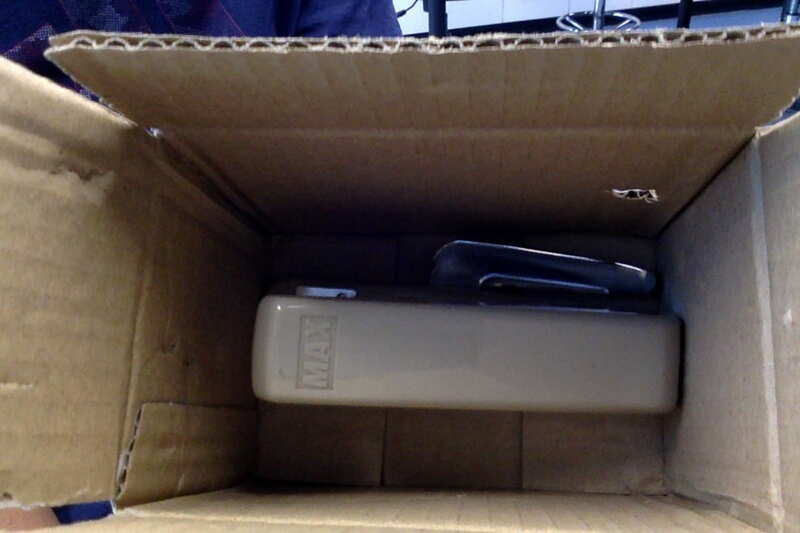 The package held a stapler (to simulate a portable charger). Our final package will hold a portable charger and possibly a charging wire. 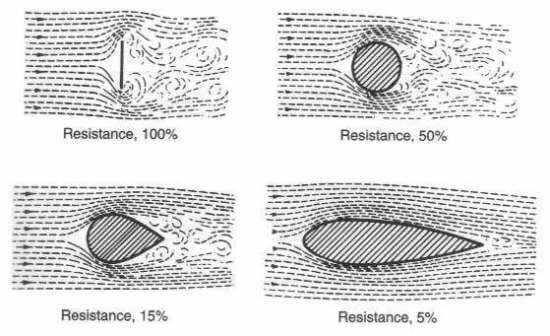 *The data recorded varies considerably, and we have measurements along the lines of 250+ newton (a measurement of force), but also as low as 18 and 75. The box started out relatively slowly, and gathered speed rapidly (I was dropping the box for all 4 drops, so I can only describe it from a top-down view). The box rolled a bit during all drops, but usually it landed on the face I dropped it on. A force plate at the bottom of the drop was used to collect data on the impact force of the package. Our group was quite successful on hitting the force plate (4/4 hits). 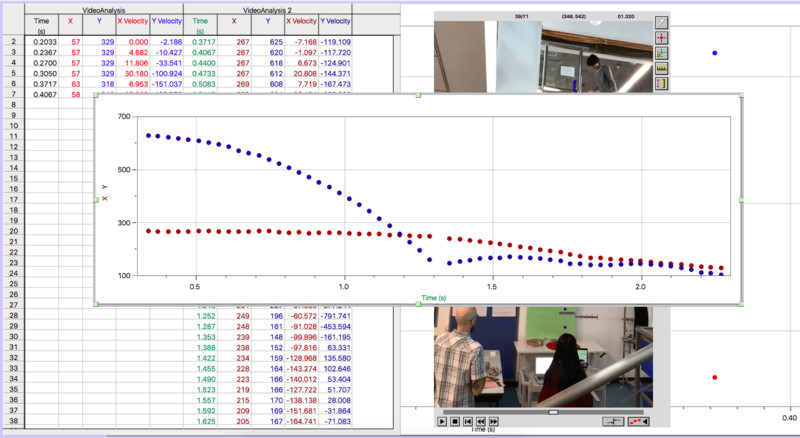 As an accuracy metric, we want or design to hit a target with the same area as the force plate from 10 meters. The average force on impact was 122.3 N. As a project metric, our group aims to reduce the amount of force excerted on our package not to exceed 50% of 122.3 N (61.15 N) at any point, be it by reducing the impact or breaking it apart. Our group is now building prototype one. An idea I have built on top of our parachute idea is that we can open the parachute 2 – 3 meters from the ground, so that the time it takes for our package to reach the ground is decreased, while accuracy is also increased because there is less time in the air, which means there’s less time for wind / air to act on the package (also there’s less area exposed to wind so the force pushing it around is smoler). On January 7th, I began Project Collisions with a design challenge. The challenge was to drop an egg from a height of 5 meters from the FA space to a table downstairs, without any yolk spilling out. A list of materials with items available for purchase and 600(imaginary)¥ was provided to buy materials. My first design involved A4 paper folded into squares, then stacked on top of each other. I expected the squares to work like tiny airbags, and each would slow the egg down slowly until the egg hits the table. Because that design only used 440¥, and there isn’t any extra credit for extra money, I created a variation of this design by adding skewers below my airbags, to slow down my egg further. The idea behind this is that the 4 skewers will take all the energy from impact and transmit it to the paper above, with friction from the paper slowing down the design further. The A4 airbags will then slow the egg enough to a speed where it (hopefully) won’t crack. Working as a group with Jonathan, both of our designs changed drastically. Jonathan’s idea was to use A4 as a parachute that would slowly drop the egg. I thought the area of the parachute would be too small to make the difference in drag needed to slow the egg down enough, and that it may start drifting off course because of the rectangular shape. Jonathan wasn’t a huge fan of my idea either (it does sound a bit crazy), so we decided to think of something completely different. The result was a teepee tent of skewers, with the egg bound to the top by string. The idea was that when the 6 legged skewer design hit the table, the skewers would disperse the energy and stop the egg. This design was semi inspired by a scouting UAV that is designed to land by stalling close to the ground and collapsing & breaking apart, which breaks up the pieces of the UAV and disperses the energy created by the landing. One concern I had before the test is that the skewers may not break up like we planned and would just dampen the impact, instead of breaking it apart. 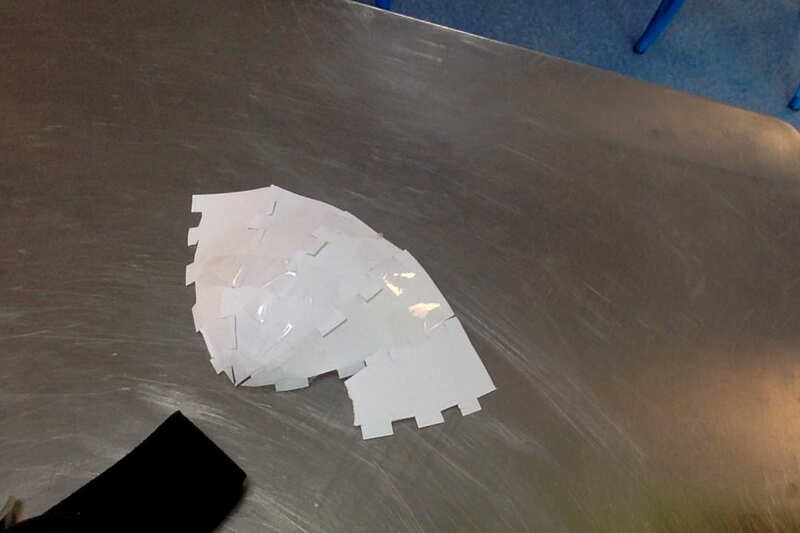 As the egg was dropping, I realised that there was something we missed in our design; weight. Remember how the egg was resting on top of the teepee tent of skewers? That actually made our design top-heavy, which resulted in the skewers being completely ignored and our design landing on top of the egg. In other words, the egg died (;-;). 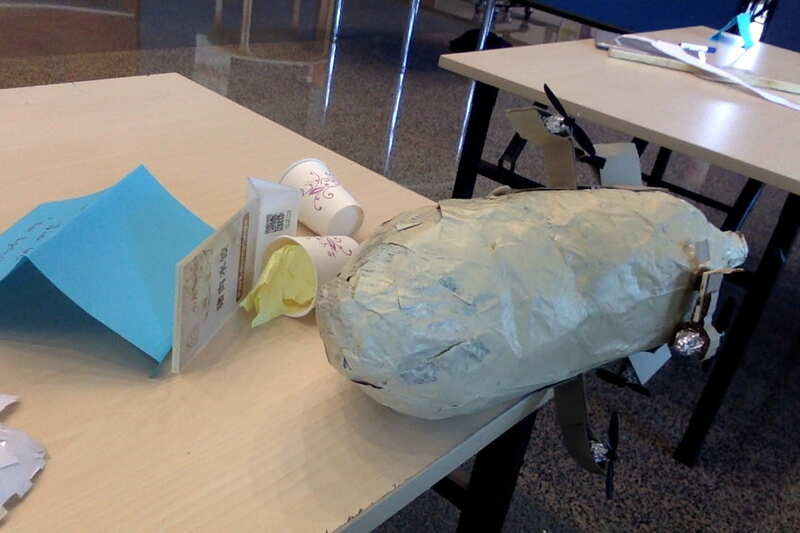 I think our design was unsuccessful because of the design flaw mentioned above, and if it HAD landed on its feed, I doubt it would have made enough of a difference to stop the egg from dying. Maaaaaaaaybe the string won’t transfer energy downwards and it would end up like a bungee cord, where the egg just bounces back up.